The second day of the Big History Conference began with the session ‘Visions of Existence, Universal Peace, and Human Society’ with panelists Professor Afshan Majid, Professor Hirofumi Katayama, and Dr. Rekha Wagani. The session began with Professor Majid presenting on ‘India & Emperor Akbar's Vision of Universal Peace’. Moving forward, Professor Katayama made a presentation on ‘Peace & Symbiosis in Tokyo’. Dr. Wagani from then presented on ‘Peace and Self-Awareness’ in relation to the youth. After the three presentations, Director Patankar posed a few questions for the panelists, and then opened it to the audience. The second session of the day, ‘Nature and the World Around us’ provided us with amalgamated perspectives from various fields on our surroundings, be it natural or social. The discussion was initiated by the moderator throwing light on the complex human wellbeing systems, natural ecosystems and the interlinkages between nature, art and science. Dr. Lucy Lafitte used water as a key element of her presentation, taking it up as a “metaphor for the biophilic vision of cities”. She began the discussion by explaining the importance of water as a source and showed the conditions of water bodies in various states. The presentation ended with her providing various examples of as to how we can better the water sources management as a way of the betterment of standard of living. The second speaker of the session was Dr. Priya Sundarrajan whose topic was ‘Saving a Fragile Legacy’. Her presentation discussed the weathering of rocks and corrosion of archaeological sites and historical artifacts due to microbial fauna. The last speaker of the session was a student from SSLA, Ms. Isha Mathur, who presented a social view on nature and the world around us, via a presentation titled ‘Marwadi Communities, Women and Change’. The session ‘Searching for Meaning’ was moderated by Professor Gayatri Mendanha started off with Mr John Clammer who presented his paper “Narratives of Hope and Future”. He spoke about creating new stories, how stories shape us, how the narratives that we create give us a primary sense of the world and influences the manner in which we design our lives. According to Mr. Clammer, stories and visuals have a way of getting embedded in our deep psychology and that stories have a way of influencing the world in a profound way. Our next speaker Enid Still presented her paper on ‘The Anthropocene: Search for Meaning/ Imagined Goal’. She elaborated her delivery on the Deconstruction of the Anthropocene. Her main argument was based on how human dominance over non-human life is omnipresent in our society. Furthermore, she spoke about the shift of the physical and the metaphysical with regards to the Anthropocene and the search of meaning. Our third speaker was Dr. Vaidyanatha Gundlupet, a professor at SSLA who presented his paper, ‘Post-Truth Politics in the Contemporary World’. He used the argument of facts versus verbal debates, and he spoke about how in the pre-truth world, lies were unacceptable but in the post-truth world not even a single eyebrow was raised at the politicians lying their way through their career. He spoke about the legal legitimisation of the political discourse and explained it with the example of the Kanhaiya Kumar case. The last speaker for the session was Matthew Chandrankunnel who presented his paper on ‘Context, Meaning and Happiness’. He spoke about how geocentricism to heleocentricism is the path to progress in the world. Moreover, he also spoke about great mathematicians of the Islamic community from the 7th century who played an important role in culminating knowledge from various sources from all over the world. The session ‘Cosmic Pedagogy: Education for a Healthy Vasudhaiva Kutumbakam’ began with Anwisha Thakur, introducing the moderators, Prof. Orla O'Reilly Hazra and Prof. Prashant Olalekar who, in turn, introduced the panelists. Dr. Roy Pereira was the first panelist. He described the various nervous systems and explained the advantages of meditation and positive thoughts for good physical health as life experiences affect the psychological and physiological makeup of the brain. He explained, ‘Cosmic pedagogy calls for all aspects of our self to be integrated. The tool for this is mindfulness and the outcome is creativity’ and engaged the audience in a thinking exercise while he sang and played soothing music. 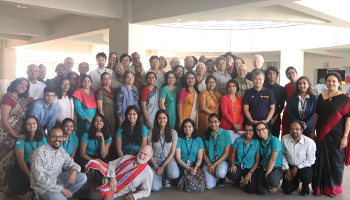 Prof. Tonmoy Halder and Megha Siddhanta of SSLA presented a paper titled ‘Human Evolution: Blend of Dashavatara, Darwin and Maslow through the Lens of Movement’. Through particular examples mentioned in the title, they focused on biology, psychology and culture to elaborate on how movement has been the base of all evolution and is the base of the human experience - specifically, language and communication.Prof. Sandip Ravindra then took the dais to focus on the loss of native Eastern psychology and hermeneutics. He specifically looked at how meta-cognitive processes are threatened due to development and how the ‘spiritual force’ mentioned in Eastern psychology has the potential to complement the three forces of Western psychology.Prof. Olalekar then engaged the audience in an activity focusing on movement therapy, which was followed by Prof. Hazra summarizing the entire session and offering her take on the presentations. The session ‘Society, Media, Performing Arts and Global Understanding’ was moderated by Prof. Shyama Dutta who went on to introduce the panelists. The first panelist, Prof. Sulakshana Sen, began by describing art as ‘A way of being and doing” and briefly discussed the role of dance. She spoke of Uday Shankar’, whose style of creative dance initially focused on portraying India exotically to the West. However, drawing inspiration from the freedom struggle, his narrative shifted to the common man’s story. She screened clippings from a film titled ‘Kalpana’ to illustrate his work. Next, Nobuo Tsujimura spoke about the fundamental role of music in evolution and the benefits of human beings’ unique ability to sing. He then discussed the integration of Big History and music through the screening of song clippings, describing this as a ‘cosmic feast’ - a gathering of all forms of expression. The third panelist, Swati Gopalkrishna, questioned the dichotomy of the classical and the non-classical which is now incorporated in all art forms worldwide and brought to light how, barring the South, Carnatic music is not celebrated anywhere in India. She discussed whether Carnatic music was really a ‘sacred tradition’ by examining its limitations and esoteric nature. Her area of focus was modern movements, specifically T.M Krishna’s flexible and inclusive style of music. She concluded by screening a short Carnatic music piece which left the audience to question the very idea of culture and whether it is an apt representation of its people. The last panelist, Tirthankar Chakravorty, began by defining and explaining knowledge. He explained how rationality prevents human beings from acknowledging coincidence to be a decisive factor. He justified his point with examples of cases from popular culture through which he concluded that education is the pathway to provide safeguards against deception. The floor was then opened for questions which stimulated further discussion and debate. The next session was on ‘Social Change: NGOs, Business, Communities and Global Network’ where a number of panelists discussed various topics of high importance. Dr. M. Paloma Pavel started her speech by talking about building sustainable and just communities through sharing of grassroots work on the ground. She discussed her book ‘The Earth, the City and The Hidden Narrative of Race’ she wrote alongside Carl Anthony, and spoke about the Big Bang among many other themes which are mainly Afro-centric.Mr. Siddhartha who was the moderator of the continued the discussion by deliberating on the topic of the Cauvery crisis between Karnataka and Tamil Nadu. He painted the bad picture of the issue, the politics surrounding it, and how people suffered in order for two states to maintain their power. Mr. Shishir Nikam focused on the ‘Immersive Tourism’s Role in cultural heritage sustainability’. Mr. Nikam narrated his case stories and the research question behind each of them.The last panelist was Prof. Aditya Nain discussed how everyone saw money in a materialistic way. He claimed financial crisis to be a social crisis.Mr. Nain spoke about community currencies and the popularity of Bitcoin.“It is not the money material that matters but what purpose it is used for”, he said. This engaging discussion ended with two questions put forth by the audience and the felicitation of each panellist. The discussion on Agriculture and The Future of The World was initiated by Dr. Priyadarshini by tracing the history of agriculture from hunting and gathering to industrial agriculture. Mr. Anand Karve’s discourse was directed to justify the natural growth of plants. He shared his hypothesis which talked about the falling of mineral rich water of guttation at night due to the usage of chemical fertilisers. He closed his statement by suggesting the use of organic materials for sustainable farming. Dr. Carl Rangad introduced his organisation NESFAS and emphasised on the exploitive and destructive nature of intensive agriculture leading to the use of artificial fertilisers. He propertied that the future of food lies in organic farming. The research by Khaliq Parker titled ‘Food In The Smart City’ concentrated on Pune and areas around that described how perishable food is grown within the city, pointing out a peri-urban market structure. He suggested that cities similar to pune need to be ‘sustainable cities’ along with being ‘smart cities’. This session concluded with bringing in diverse issues of farming and how they bring imbalance to the ecosystem. The conference was brought to an end by a peaceful and engaging session- The Cosmic Walk. Prof. Orla Hazra focused on the symbolic importance of the circle and the rope. The lights were switched off and the participants were asked to concentrate on the candles while soothing background music was being played along with the narration of history of universe. A number of participants then went around the spiral path formed by the rope. The session came to an end with the space being declared open for those who wished to stay for a little while longer to embrace the positive energy and vibe present in the environment. The session ended with a Vote of Thanks by Prof. Anita Patankar wherein she expressed her heartfelt gratitude to the dedicated volunteers, the professors closely involved with organizing the events and the whole student body for being able to manage such a successful conference.